Zion Market Research has published a new report titled “Fish Oil Market by Type (Tilapias, Crustaceans, Marine Fish, Salmon & Trout, and Others) and by Application (Aquaculture, Animal Nutrition & Pet Food, Direct Human Consumption, Pharmaceuticals, and Supplements): Global Industry Perspective, Comprehensive Analysis, and Forecast, 2017 -2024”. 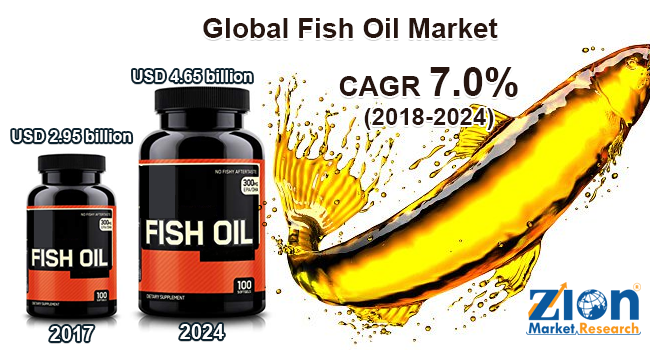 According to the report, the global fish oil market was valued at around USD 2.95 billion in 2017 and is expected to reach approximately USD 4.65 billion in revenue by 2024, growing at a CAGR of around 7.0% between 2018 and 2024. Increasing consumer awareness regarding the health benefits of omega-3 is expected to drive the global fish oil market during the forecast period. In addition, increasing product consumption in defensive coatings and lubricants is likely to boost the global fish oil market growth in the coming years. Furthermore, a high consumption of DHA/EPA helps in lowering blood pressure and bad cholesterol and reducing the risk of coronary heart disease (CHD), such as strokes. These health benefits are anticipated to support the global fish oil market growth. The rising prevalence of cardiovascular diseases worldwide is a key factor propelling the global market growth. For instance, as per the World Health Organization, cardiovascular disease (CVD) is a leading death cause globally. Approximately 17.7 million people have suffered and died due to CVD in 2015. Of these deaths, around 7.4 million people had coronary heart disease and about 6.7 million people had a stroke in the same year. This data represents a high prevalence rate of CVD across the globe. Therefore, this will also lead to an increase in the research and development activities of drug development and supplements production. This is projected to fuel the global fish oil market growth during the forecast period. Furthermore, fish oil is also used as a vital ingredient in cosmetic products and all-purpose ointments, which is expected to contribute a significant market share in the coming years. The global fish oil market can be segmented based on type and application. Based on the type, the global fish oil market can be classified into tilapias, crustaceans, marine fish, salmon and trout, and others. The salmon and trout segment is expected to attain a major market share from 2018 to 2024. This is due to the growing importance of salmon for direct consumption for strengthening the muscles and heart and improving metabolism. Based on application, this market can be divided into aquaculture, animal nutrition, and pet food, direct human consumption, pharmaceuticals, and supplements. The aquaculture segment is expected to gain more share in terms of value during the forecast period. This can be attributed to the development of the fishing industry, due to the high demand for fishes for direct human consumption and the positive industry outlook on aquaculture activities. Based on geography, the global fish oil market finds its market scope in Europe, North America, Latin America, Asia Pacific, and the Middle East and Africa. Europe is expected to be the most promising region in the global fish oil market due to large-scale salmon and trout farming in the region. The Asia Pacific fish oil market has also grown over the past few years, especially in China, owing to the booming aquaculture industry. The report also includes detailed profiles of key players, such as Colpex, American Marine Ingredients, Croda Inc., Omega Protein, Copeinca ASA, Epax AS, GC Rieber Oils, and Corpesca S.A. The detailed description of players includes various parameters, such as company overview, financial overview, business strategies, and recent developments of the company.